As you enter the suite you will be greeted by the tranquilizing sound of the Ocean just a stones toss away... Feel the gentle and cooling trade-winds blow through your hair while you relish in the panoramic Ocean Front views, the neighboring islands of Lanai and Molokai appear close enough to swim to. Leave all your cares at home and embrace the sluggish Hawaiian pace where the biggest decision today is flip flops or bare feet. Papakea is an exquisite resort of 11 low-rise condo buildings built on a sprawling and beautifully landscaped 13 acres, as close to the Ocean as you can get... The “L” building is one of just 3 Oceanfront buildings on property and THE CLOSEST to the Ocean, a truly amazing place to enjoy a one of a kind West Maui sunset. In the winter (and spring), the humpback whales are commonly seen just a short distance away offering a private show of breaching, spouting and waving. The resort also offers several free exercise classes, once a week Mai Tai and Hawaiian music gathering as well as a putting tournament. There is an on-site concierge for all of your excursion needs. This condo comes with a fully stocked kitchen with everything you need to prepare meals. It is equipped with a Bosch washer and dryer. We supply beach towels, 2 beach chairs, 2 boogie boards, there are several games/puzzles, lots of Maui guide books, and a starter supply of the some of the basics (soaps, toilet paper and paper towels). The unit was recently remodeled including tile floors, an open concept kitchen, stainless steel appliances, granite counters and renovated bathrooms. This condo is managed by a local property management company (located just three blocks away) to ensure a stress-free vacation. 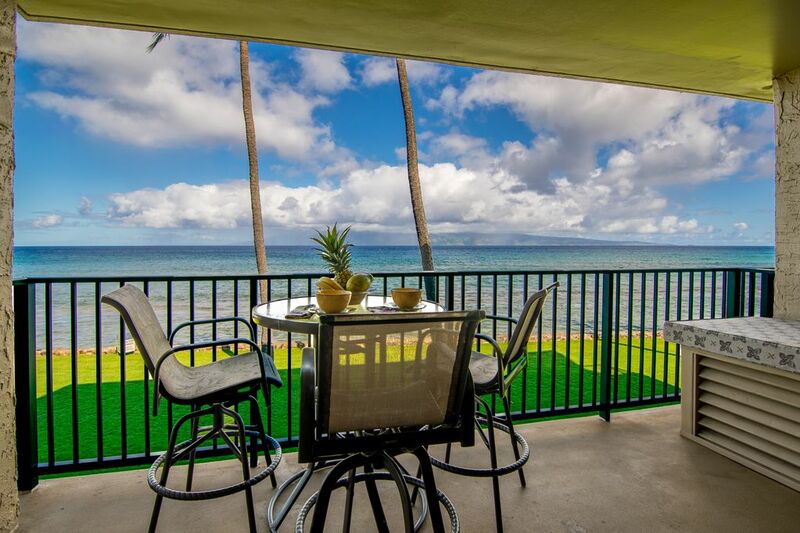 They specialize in ONLY the finest vacation rentals in West Maui. We are a small property management company located in West Maui. We have been in business for 10 years and specialize in only the "finest" Ocean Front and Ocean View Condos/Homes in West Maui. Good grounds and nice condo with great view. Bed in master could have been bigger but workable. Have been to the Papakea many times and have stayed in this unit twice now. A beautiful unit that is oceanfront. Seeing whales from our unit every day. Restaurants in several resorts next to the Papakea. Easy walk. Would definitely stay in this unit again!! This suite was recently sold. This guest stayed during the transition and her wonderful comments were posted by the new owner. With a few recent upgrades we plan to continue providing exceptional service to our new and returning guests. Book and experience the difference. I have been coming to Maui and specifically West Maui for decades. I had never stumbled across this property in the past. I don’t know how they keep this gem of a property such a secret!! The grounds of Papakea are beautiful and everything you want to have when you go to Hawaii. Lush mature foliage, tranquil koi ponds. walkways with bridges, but also lots of activities. 2 -12 hole putting courses, pickle ball, tennis, shuffleboard. Makes you feel like you don’t even need to leave the property. I liked that the abundant lounge chairs were on the grass as opposed to the sand, and there were always plenty chairs. (No need to stake out chairs like at many resorts) The swimming was nice in the afternoon with the lower tide allowing easiest access between the reefs which were good for sighting some fish and turtles. The humpbacks came by almost daily, At times it seemed like maybe just 2 football fields away. The unit was located in one of the OCEANFRONT buildings. It is on the second floor, so when standing in the living room, the view almost seems like you are in a boat. The unit itself was very well maintained and clean with an updated kitchen. There was AC in the living room. The kitchen had lots of supplies you don’t normally find in a rental, such as spices. And a few other handy pantry items. I enjoyed eating out on the Lanai. The TVs were new so we had access to Netflix in addition to cable. The absolute best part was waking up to the sound of the waves crashing on the shore. It was such a great way to start the New Year! I would definitely come back. It was one of my favorite stays in West Maui. Nancy is the new owner of this lovely apartment and we had the best Christmas here ever! The apartment is right on the water and you can even hear the waves crashing from the living room. The unit was in excellent condition and well maintained, with a fully stocked kitchen (basic pantry items, tons of dishes/silverware, many pots and pans) and everything was very clean and organized. In addition, there was a closet with beach towels, toys, and a cooler for you to use for taking picnics to the beach. The washer/dryer in the unit was a lifesaver for us since we stayed around a week -- it made it easy to pack light and just run a cycle when we needed to clean some towels or clothes. The unit has two bedrooms and two bathrooms which made it a good sized apartment for four people. The AC couldn't quite reach into the bedrooms but Nancy will be extending the AC units into the bedrooms and also changing up the bedroom linens, which will be nice for future residents. I have very high standards for bathrooms and these bathrooms were very clean also well maintained. Note: there is only basic soap provided so be sure to bring bath products with you when you go. There is cable (but we didn't even turn a TV on) and the wifi is pretty good as well. In addition, the resort has some free activities for guests. We took advantage of the lei-making; there is also yoga, tennis courts, etc. On your first day there is also a free breakfast with the concierge to discuss excursions and activities on the Island -- we actually won a free ticket to a Luau at it so definitely go if you're not too tired in the morning from traveling! Nancy was very easy to communicate with and this was a wonderful apartment. We wouldn't hesitate to stay here again if came back to Maui! Beautiful view and fully stocked Condo! The Condo had beautiful views and was completely stocked with everything need for a fabulous vacation including sand toys, chairs, coolers, etc. We would stay here again! We loved being so close to the water. The sun rises and sunsets were amazing. You are always welcome! Come again!